Syria’s national team has raised its score of medals at the competitions of the second day of the 1st Special Olympics World Games , held in the Emirati capital of Abu Dhabi to 19 golds, 24 silvers and 13 bronzes. 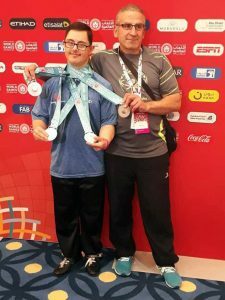 The Syrian team had harvested a gold medal and 8 silvers in the competitions of the first day of the Special Olympics World Games. In the skateboarding competition, athlete Abdulrahman al-Khayyat won a bronze medal and the weightlifting competitions, athlete Asma Nasser Eddin won a gold medal and 3 silvers. Meanwhile, athlete Abdulrahman al-Halabi won three silver medals in various competitions.